TEWKSBURY, MA -- Both Rangers squads were back in action this past week as the EHL team went 3-1-0 over their four games, improving their overall record to 23-12-3, which is good for 2nd place in their division and 4th place overall in the conference. The Premier team on the other hand, took care of business in all three of their games, as they still sit in 1st place in their conference with a record of 28-3-3. Last Tuesday, the Rangers hosted the New England Wolves for the third time this season. The Rangers beat the Wolves 6-0 in their first matchup, but the Wolves won the most recent meeting between the two teams back in November. Andrew Keith gave the Rangers the early lead just under five minutes into the contest, then Clay Ellerbrock put the boys up 2-0 just a few minutes later. The Wolves answered with a goal of their own halfway through the 2nd frame, but Elllerbrock found the back of the net again to give the Rangers back the two-goal advantage. Despite a late short-handed tally from the Wolves, the Rangers held on for a 3-2 victory. Aiden Curry was solid in net, stopping 33 shots in the win. The boys returned to action on Wednesday, as they hosted the 1st-place New Hampshire Avalanche. Anton Metelev put the Rangers ahead first, just over five minutes into the game. However, the Avalanche would fight back to even things up near the end of the opening period. The Avalanche took the lead in the 2nd frame and then added three more goals in the 3rd period to win by a final score of 5-1. Billy Girard was busy in net, stopping 33 shots in the loss. The Rangers returned to action this past weekend as they traveled to Haverhill, MA on Friday for a matchup against the Valley Jr. Warriors. Going into Friday’s game, the Rangers had already beaten the Warriors twice, but lost the most recent matchup between the two teams back in January. John Grealish put the Rangers ahead first, with a goal just under the 12-minute mark of the 1st period. Ellerbrock made it a 2-0 game just 40 seconds later, and Grealish found the back of the net again just after that to give the Rangers a three-goal lead. The Warriors would get a goal back near the end of the frame, but Keith took the three-goal advantage right back in the first minute of the 2nd period. Zack Norby then made it a 5-1 game a few minutes later, but once again the Warriors rallied, scoring a pair of goals near the end of the frame to cut the deficit back down to two. However, the Rangers came back strong in the 3rd period as Grealish completed his hat-trick and Jake Blackwell notched his first goal with the Rangers organization as the boys won by a final of 7-3. Curry stopped 24 shots in net for his team-leading 11th win of the season. The Rangers wrapped up this past weekend on the road with a game against the Seahawks Hockey Club on Saturday night. Going into Saturday’s game, the Rangers held a 1-1-0 record against the Seahawks this season, beating them in the last matchup together back in October. The Seahawks took the early lead on Saturday, but Erik Nilsson notched his 5th goal of the season late in the 1st period, to knot up the game at one goal a piece. The Seahawks took the lead again in the first minute of the 2nd period, but Danila Larionovs scored just a few minutes after to even things up at two apiece. The game remained scoreless until the 17:34 mark of the 3rd period, when Blakewell gave the Rangers the lead and they held on from there, winning the game by a final of 3-2. Girard stopped 33 saves in the winning effort, for his 10th win of the season. On Friday, the Rangers traveled down to Walpole, MA to wrap up the season series with the Express. Going into Friday’s game, the Rangers held a 4-1-0 record against their division rival this season, winning the most recent matchup in Tewksbury just a couple weeks ago. The Rangers didn't waste any time as Matt Orlando found the back of the net just 23 seconds into the game, to give the boys the early lead. Tanner Caldarola made it a 2-0 game just 57 seconds later, but the Express cut the lead in half a few minutes after that. Both Matt McPherson and Jake Brown added goals near the end of the period as the Rangers took a commanding 4-1 lead into the 1st intermission. The Express answered back with a goal near the start of the 2nd period, but Jake Mecrones took the three-goal lead back near the five-minute mark of the frame. McPherson, Mitch Gillespie, and Orlando added 3rd period goals as the Rangers won the first game of the weekend by a final score of 8-5. The squad returned back home the very next night for a matchup against the Connecticut Chiefs. Going into Saturday’s game, the Rangers held a 1-0-1 record against their divisional opponent this season, losing the most recent game between the two teams in a shootout last month. Steve Johnson gave the Rangers a boost with a pair of goals in the 1st period, as the boys took a 2-0 lead into the 1st intermission. The Chiefs cut the lead in half early in the 2nd frame, but Eric Hambling took the two-goal advantage right back less than two minutes later. The Chiefs responded again later in the frame to cut the lead back down to one goal, but the Rangers pulled away in the 3rd period with goals from Gillespie and Dennis Engelson, and won by a final score of 5-2. Bobby McCloskey stopped 26 shots in net for his 14th win of the season. On Sunday, the Rangers wrapped up their week with a matchup on the road in Haverhill against the Valley Jr. Warriors. The boys wasted no time as Tanner Caldarola put the Rangers ahead just 46 seconds into the game. Caldarola scored again a few minutes later and the Ragners didn't look back from there. Hambling and Luke Marsh added goals later in the frame, as the Rangers took a 4-0 lead into the 1st intermission. Josh Barton added a goal in the second period and then both TJ Aiello and Orlando added 3rd period goals, as the Rangers cruised to a 7-1 win. Ryan Bevan stopped 9 shots for his 4th win of the season. 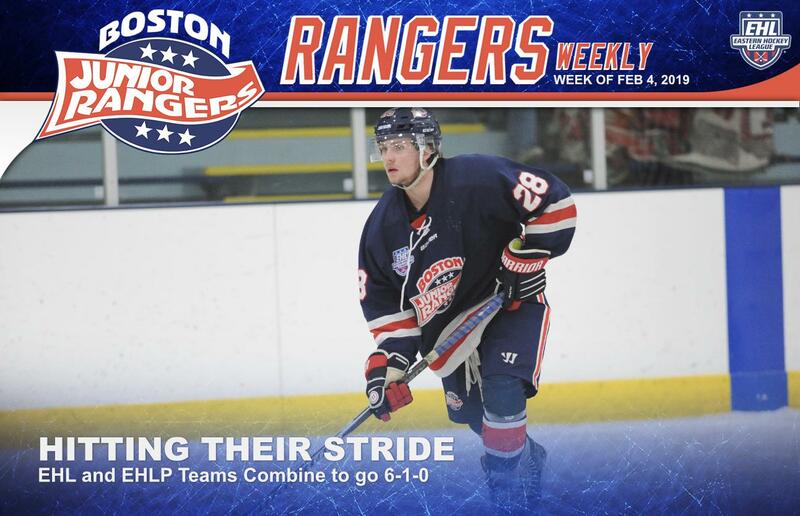 One busy week leads into another for the Rangers organization, as the EHL squad will square off against the Walpole Express on the road on Friday, followed by a matchup back home against the New Hampshire Avalanche on Saturday. Make sure to attend Saturday’s game against the Avalanche as all proceeds from the game will help to benefit the thousands of disabled veterans served annually by Project Healing Waters Fly Fishing, Inc. (PHWFF) programs. On the other end, the EHLP squad will stay home for the weekend and matchup against Connecticut Chiefs on Saturday, followed by a big divisional battle against the second place New England Wolves on Sunday.